Everything you need to clean and protect your vinyl convertible top! Let’s face it: we spend more time cleaning, polishing, waxing and obsessing over our vehicle’s paint than any other interior or exterior component. Don’t forget about the convertible top! If your daily driver or weekend toy is a convertible, you can make caring for the top nearly effortless with RaggTopp Convertible Top Care Products. RaggTopp Convertible Top Care Products enable you to spend more time applying your favorite coat of carnauba paste wax to the paint and less time worrying about how well protected your convertible top is. 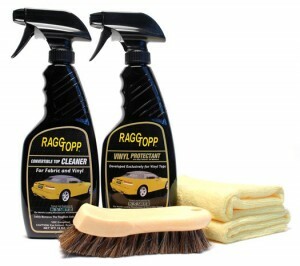 RaggTopp makes this easy with the RaggTopp Vinyl Convertible Top Cleaner & Protectant Kit. Caring for your convertible top isn’t nearly as time consuming as you may have previously thought. With a little bit of knowledge and the right products, your convertible top will look as good as the rest of your vehicle. The RaggTopp Vinyl Convertible Top Cleaner & Protectant Kit contains everything you need; starting with the RaggTopp Vinyl/Fabric Cleaner and their super soft Natural Horse Hair Convertible Top Brush to the RaggTopp Vinyl Protectant and several microfiber towels to make clean up a breeze. What’s more, RaggTopp Convertible Top Care Products are endorsed by Haartz, the leading manufacturer of convertible tops. This little kit was introduced at Detail Fest and the timing couldn’t be better! As the temperatures warm up, many of you will be pulling the covers off your convertibles and getting them ready for some sunny afternoons. Before you hit the road, do your car a favor and treat the convertible top windows with the RaggTopp Convertible Top Plastic Window Cleaner & Protectant Kit. You’ve seen what a neglected convertible top window looks like – yellow, cracked, and cloudy. It’s not attractive or functional! The RaggTopp Convertible Top Plastic Window Cleaner & Protectant Kit was created to prevent the UV degradation that naturally occurs on convertible top windows. Step one is RaggTopp Convertible Top Plastic Window Cleaner. This environmentally friendly, non-toxic cleaner safely removes grime, water spots, and contamination from the soft plastic. The formula is biodegradable and safe on a variety of plastics. Use it on clear plastics, Jeep windows, helmet visors, motorcycle windscreens, headlights, vinyl windows, Lexan and Lucite, and other plastic and vinyl window enclosures. Step two is RaggTopp Convertible Top Plastic Window Protectant. This silicone-free sunscreen also blocks out moisture and dirt. The sophisticated formula contains Ciba Tinuvin UV blockers and it is boosted with Polycharger to provide a longer lasting protective barrier. Just like the cleaner, you can use RaggTopp Convertible Top Plastic Window Protectant on all automotive, marine, and commercial clear plastics. Foam Applicator Pad, 4.25 in. x 3.5 in. x 1 in. Use this pad to apply RaggTopp Convertible Top Plastic Window Cleaner. The texture of the foam will aid in cleaning the plastic surfaces. Microfiber Applicator Pad, 5 in. x 3.5 in. x 1 in. Use the microfiber pad to apply RaggTopp Convertible Top Plastic Window Protectant. The microfiber will ensure an even coat of protectant and the soft fabric will not scratch any surface. Microfiber Towel, 15 in. x 15 in. Buff away RaggTopp Convertible Top Plastic Window Protectant with this soft microfiber towel. The nonabrasive towel has looped fibers that will grab the protectant residue as it gently polishes the plastic to a shine. The RaggTopp Convertible Top Plastic Window Cleaner & Protectant Kit is packaged in a small, reusable box – perfect for stowing in your trunk or detail bag. RaggTopp is the industry leader in convertible top care. RaggTopp is tested and endorsed by Haartz, Roll-N-Lock, Robbins AutoTop Company, Colgan Custom, and many more! Maintain your convertible top window with the RaggTopp Convertible Top Plastic Window Cleaner & Protectant Kit from the convertible top care experts! Get your RaggTopp Convertible Top Plastic Window Cleaner & Protectant Kit at Autogeek.net!